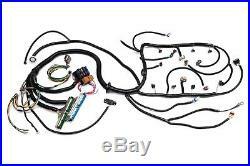 99 -’06 Vortec Swap Standalone Wiring Harness. 99 -’06 VORTEC with EV1 Injectors, 5 PIN MAF Sensor. Mechanical Throttle Body and 4L60E Transmissions. Parts Included Complete Engine and Transmission Wiring Harness including all engine and transmission sensor connectors, ALDL Connector, 7 ATO Style Fuse Block, Fuel Pump Relay, Switched Power Ignition Relay, Cruise Control Wiring, Performance Shift Mode Wiring, MIL Light Wiring, P/N Wiring, TCC/Switch Wiring, Tach Wiring, Complete Detailed Instructions. Description These harnesses are designed for’99 -’06 Vortec (w/LS1 Intake Manifold) play with switched power, constant power and ground connections required. Harnesses allow for installing the PCM underneath the dash of your vehicle with a sliding grommet seal for that professional leak proof look. Harnesses are professionally constructed from Brand New GM Delphi Connectors and TXL (Polyethylene Cross Linked) High Temperature Wire to GM Specifications. Note that harnesses are for non-emissions equipped vehicles and do not include air pump or EGR provisions. 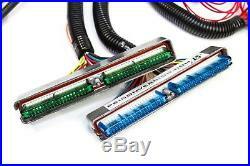 All conversion swap harnesses require PCM VATs removal, and is available through Sho-Me Speed. Easy 4 Wire Hookup. The item “99’06 4.8/5.3/6.0 with4l60e Standalone Swap Wiring Harness (DBC) LS1 Intake” is in sale since Wednesday, June 6, 2018. 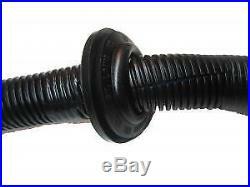 This item is in the category “eBay Motors\Parts & Accessories\Car & Truck Parts\Computer, Chip, Cruise Control\Other”. 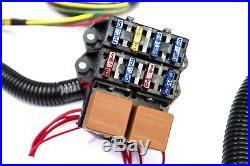 The seller is “shomespeed417″ and is located in Ozark, Missouri. This item can be shipped to United States, Canada, United Kingdom, Denmark, Romania, Slovakia, Bulgaria, Czech republic, Finland, Hungary, Latvia, Lithuania, Malta, Estonia, Australia, Greece, Portugal, Cyprus, Slovenia, Japan, China, Sweden, South Korea, Indonesia, Taiwan, South africa, Thailand, Belgium, France, Hong Kong, Ireland, Netherlands, Poland, Spain, Italy, Germany, Austria, Israel, Mexico, New Zealand, Singapore, Switzerland, Norway, Saudi arabia, Ukraine, United arab emirates, Qatar, Kuwait, Bahrain, Croatia, Malaysia, Brazil, Chile, Colombia, Costa rica, Panama, Trinidad and tobago, Guatemala, Honduras, Jamaica.